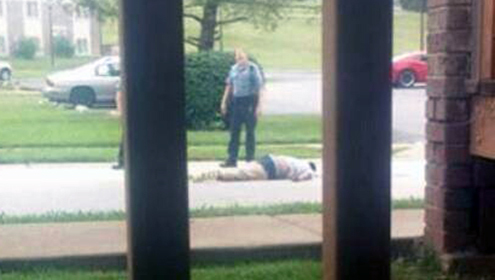 The body of Michael Brown lying dead in the street. I would like to share with you some personal reactions to last November’s announcement that Ferguson police officer Darren Wilson would not be indicted for the killing of unarmed teenager Michael Brown. First and foremost, I believe our collective sympathy must go to the family and friends of Michael Brown. Though it may be impossible for most of us to comprehend what it means to lose a son or loved one to violence, we all have a duty to try. Second, I think it is imperative to validate the frustrations that millions of Americans across the country have experienced in the wake of the decision. Sometimes anger is not only justified, it is morally required. I believe that this is one of those times. We have an obligation to be angry because the death of Michael Brown and the failure of the grand jury to indict his killer, Darren Wilson, must be understood in the context of racial discrimination and oppression in the United States. Patterns of racial profiling, police violence, and the hyper-criminalization of communities of color have served to dehumanize African American boys and men since the inception of this country. We should be outraged by Brown’s death and the grand jury decision not because they are aberrations but because they remain the norm. Countless individuals suffer the full range and devastating harms of the same structural racism that took Michael Brown’s life and prevents Darren Wilson from standing trial. Yet the dominant culture tells us that their names, their families, their stories, and their lives do not matter. All of us have a responsibility to resist this horrible deception. Lastly, the reality of diversity is that discrimination affects each community differently. But rather than let those differences preclude understanding, we can work to make them precursors for empathy. Many of us who are Asian American identify with the experience of being rendered invisible, marginalized, and dehumanized. We should turn those experiences into catalysts for positive change that is fully inclusive. There is no doubt we all must do more to affirm that Black lives matter. And we must search for a solidarity that goes beyond enlightened self-interest in favor of one that commits to deeper compassion and broader self-transformation. It is my heartfelt hope that we all bring our best selves to the national conversation about what we can learn from Ferguson, what type of country we want to be, and how we make that happen.